We couldn’t leave the guys hung out to dry after yesterday’s Ladies What to Wear post. For the past two years, we’ve brought you the top summer trends to rock during Chicago’s biggest music fest, and the guys edition is back once again as well. Luckily the weather seems like it’s going to comply, so follow the guidelines below and there’s a good chance you’ll make the Best Dressed list of a fashion blog or two ;). Let us know if there are any looks you think are an absolutely necessary addition. There are two days left to put together the perfect outfit for one of the most hyped-up nights of the year- New Years Eve. Whether your plan is to check out a new bar in the city or get together with friends at a house party, this is one of the only nights of the year where it’s completely acceptable to look like a disco ball in sequins. Stay classy in black, sparkle in gold, or go bold in my personal favorite- blue. Girls and guys, check out the photos below for a little inspiration for putting together your look! We gave you our top picks for girls’ fall fashion a few weeks ago, but we didn’t want to leave the guys hanging. Check out our list of what’s hot and a must-try for guys this fall. 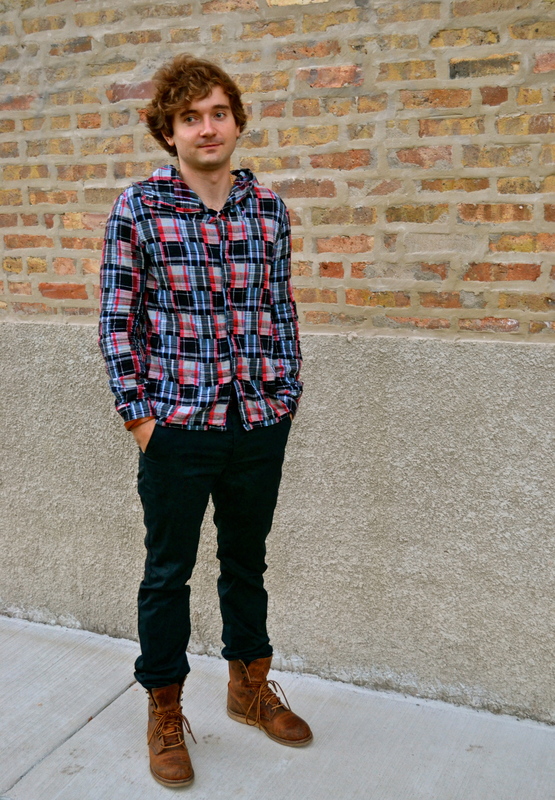 And they say Chicagoans don’t have style? False. Stand out from the flannel craze by opting for a patchwork shirt instead. The quilt-like pattern below is more interesting than the standard checkers on a flannel, and the attached hood on the button-down keeps the look even more unique. Still looking for Halloween costume? Let the music inspire you. Check out our picks for the best artists to mimic this year. 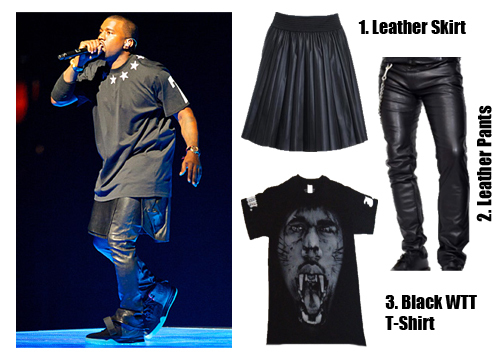 Kanye West: the guy who made the leather “man skirt” fashionable. If you’re a guy who’s been itching to wear a skirt, this costume is for you. Leather is a huge trend right now, so finding any of the pieces below will be simple. Get an original Watch The Throne t-shirt for $1000, a fake WTT t-shirt for $100 or a black Old Navy t-shirt for $10- your call depending on how badly you want to be Kanye this Halloween. Ah Nicki Minaj. 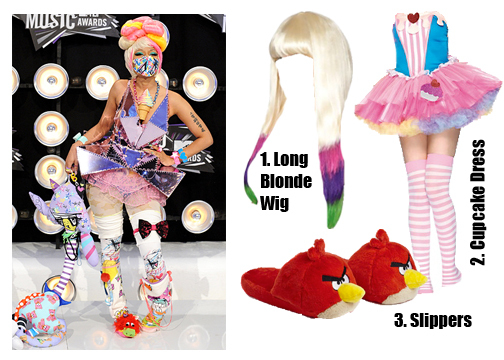 She’s had so many outrageous outfits this past year, it was hard to choose just one look for Halloween. Hey, why not put an ice cream cone around your neck and grab some inflatable pool toys? The more ridiculous the accessories, the better. The best weekend of the year is FOUR days away. 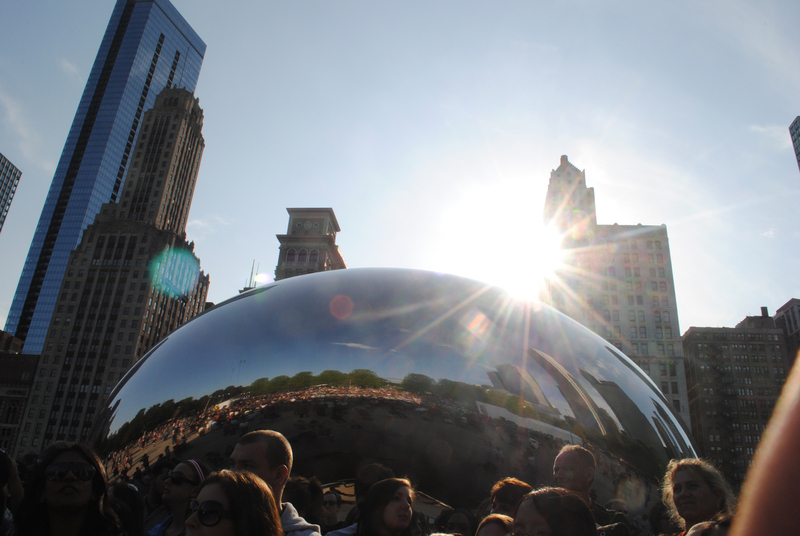 On Friday, Grant Park will be transformed into a giant music venue as fans and artists will fly in from all over the world for Lollapalooza. With over 160,000 people estimated to be in attendance, there are bound to be some serious people watching opportunities. As you’re creating your custom Lolla schedules and RSVP-ing to the best Lolla after-parties this week, we’re here to help make sure you also look your best this weekend both at the fest and at the after-parties (in case you run into Frank Ocean at Buckingham Fountain on Saturday night). The “Week that Was” has been MIA the last two weeks, but is back today for the official Spring Awakening Special. The countdown has been on our site for about two months now, and today reads just “3 days to go.” The inaugural electronic dance music festival in Soldier Field features some of the biggest names in music today, and you can still purchase tickets here! Don’t forget to check out the after parties either! Enjoy! NYC-based FLüD Watches recently collaborated with singer, song writer, and producer Mayer Hawthorne (one of ACITM’s favorites). The two collaborated for a special edition “TABLETURNS” timepiece. Once recognized as “DJ Haircut” and being an avid record collector, it’s easy to figure out the design inspiration behind the timepiece. Watches are a must have spring/summer accessory. Top off any outfit the right way with a touch of sophistication. Friday afternoon EXPRESS held an outdoor fashion show in front of “The Bean” in Millennium Park in Chicago featuring their Fall 2012 collection. EXPRESS has staged similar runway events in New York, Las Vegas, Miami and Dallas, and with the beautiful Chicago skyline in the background, the event was a major success. Fashion magazines are already buzzing about the must-have looks for fall, but I’m not willing to give up the fact that there is still over a month of summer left, and there is no better place to whip out the season’s hottest trends than for my favorite weekend of summertime Chi- Lollapalooza.